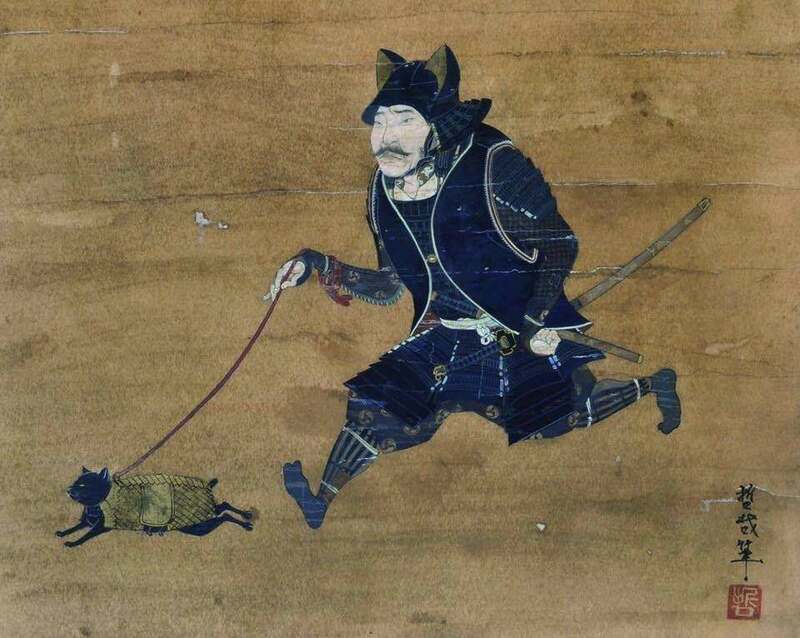 What’s the story behind the samurai walking a cat, anyway? ‘Warrior takes an armored cat for a walk’ (??????????) by Noguchi Tetsuya, 2014. Image widely shared on social media. There’s an image that’s been shared on social media dozens of times over the past few years, typically without attribution. The image depicts a shoeless samurai walking an armored cat. The samurai has a helmet with cat ears, and the image appears to be weathered and old, perhaps dating back to Medieval Japan. In reality, the paint is the creation of Japanese artist Tetsuya Noguchi, whose specialty is to depict samurai in bizarre, often comic situations. He appears to have mastered traditional techniques to create highly-detailed replica armor that would not be out of place in a museum. The best practitioners of this genre (Masami Teraoka comes to mind) make it work not because of the obvious satire, but because of their mastery of the classical art form used to set up the spoof. And once in a while the artist’s technique is so exquisite that it elevates the work entirely out of the realm of parody, however droll the subject matter. Tetsuya Noguchi’s work is just such an example. [HAPPENING] Tetsuya Noguchi “ANTIQUE HUMAN” http://bit.ly/2kaD2Vg Where the SAMURAI are. Old but new world. Besides frequently popping up on Twitter, Noguchi’s work is regularly shown in Japan. His exhibition ‘From Medieval With Love‘ is currently on display at the Pola Museum Annex in Ginza, Tokyo.